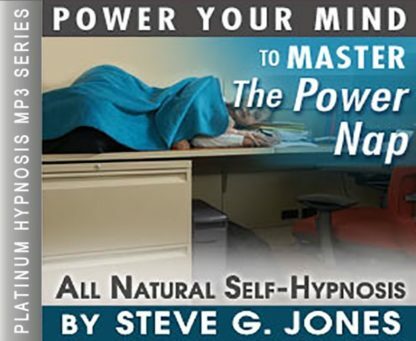 Take a quick power nap anytime with this rejuvenating self-hypnosis mp3 by Dr. Steve G. Jones! Need to be rejuvenated? If you have trouble relaxing enough to make a quick nap possible, then hypnosis can help. Hypnosis soothes and relaxes you so you can let go of the worries that make it impossible to slow down long enough to get your power nap. There are many advantages to power napping. My Master Power Naps Hypnosis MP3 sets the stage for a nap that is restful and recharges you so you can do all that you need to. Often in the afternoon as lunch settles and blood sugar adjusts you may find yourself dragging. A power nap is the perfect pick-me-up to get you through the rest of the day. Studies show that 70 percent of people who work full time get an average of only 6 hours of sleep per night. The ideal is 7 ½ – 8 hours, so they are quickly building up deficits. The good news is that naps count toward the daily total of needed sleep. Getting an extra hour even in midday is effective. If you just can’t seem to get your mind to slow down enough, then hypnosis does the job. After learning the hypnosis techniques needed to power nap, you will be equipped to use hypnosis on your self whenever needed. Many companies are recognizing the benefits of a midday power nap even at the office. Some companies are designating areas with couches and low light where 20-30 minute power naps can take place on the premises. Steve G. Jones is a clinical hypnotherapist who has created the Master Power Naps Hypnosis MP3 session. In it he teaches the listener to completely relax and how to block out the distractions, both internal and external, that can hinder effective rest. You can use the hypnosis methods at home, work, and even sitting in a public place to rejuvenate yourself anytime. Steve G. Jones, Ed.D., Clinical Hypnotherapist, charges $1,500 for a custom recording and $25,000 for a one-hour private hypnotherapy session at his office. But you can get all the benefits for this low price. Simply listen to the Master Power Naps Hypnosis MP3 audio every night as you go to bed for three weeks and feel the changes happening in your life. You will feel more empowered, more in touch with your true self, and you will truly know that your goals are within your reach. Steve G. Jones achieves AMAZING and LASTING results!!! Hypnosis is the easiest way to affect change in your life because the positive messages go straight to your subconscious mind effortlessly so you can accomplish your goals and reach for the stars!! All you have to do is listen to the Master Power Naps Hypnosis MP3 download at night as you go to sleep!!! You’ll hear soft music, the gentle sounds of the beach, and the soothing sound of Steve G. Jones’ voice all working together to bring about positive changes in your life easily and naturally. Steve G. Jones has been helping people improve their lives with hypnosis for over 17 years…now it’s time for him to help YOU… don’t wait, do it NOW !!! you’ll be glad you did. See you at the top! You are so very relaxed. You have taken this time out to just relax and drift and float. So relaxed and at ease, just letting go of your cares, that’s right. Just focusing on relaxation, relaxing more and more, that’s right. Relaxing and drifting and in a few moments when you return to full awakening consciousness, you will be so well rested, so well rested. You will feel as though you have had a very peaceful nap. And you feel full of energy, recharged, revitalized. So just continue to relax, but realize just how wonderful you are. You are an amazing person. You are so powerful, so focused, so full of confidence and motivation. You are a very giving, warm, wonderful, loving person. Attracting love into your life, attracting warmth, that’s right. And people perceive you as a wonderful, loving, calm, relaxed person. You are so very confident. You are a wonderful, loving person. Attracting all the abundance to you, that’s right. Your life is becoming more and more abundant, financially, emotionally, physically. You are becoming more powerful. Your health is becoming abundant, that’s right. Physical abundance means your health is improving day by day. Financial abundance means that you are attracting to you, wealth all the time. Emotional abundance means that you are becoming calm and loving and very relaxed, very relaxed and very happy finding joy in your life, finding joy in the things you do. So relaxed and realize that everything is just fine. Your life is becoming more and more powerful and abundant. As you take time now to recharge yourself, to recharge your physical body, to recharge your spirit, to recharge your emotions, to calm yourself and in a moment when you return to full awakening consciousness, you will be full of energy, fully recharged. Ready for whatever you have to do next. Ready to handle it in a very powerful, energetic way. You are so relaxed, so relaxed. Alright now, coming back up at the count of three and when you come back up to full awakening consciousness, you will be wide awake. Wide awake and full of energy because you have relaxed and recharged yourself. Taking a power nap during the day allows you to re-energize your mind and body! This hypnosis recording is 60 minutes long and it will allow you to relax into a deep state of relaxation. At the end of the recording, Steve will tell you to wake up refreshed and energized to continue on your day! This hypnosis recording is a great way for you to relax and get a power nap in in order to recharge your body. Studies have shown that taking a short nap in the middle of the afternoon improves your performance in any task. We suggest you listen to this Master Power Naps Hypnosis MP3 recording whenever you in need of a power nap. No matter what time of the day you want to experience a power nap, this hypnosis session will help you achieve it!